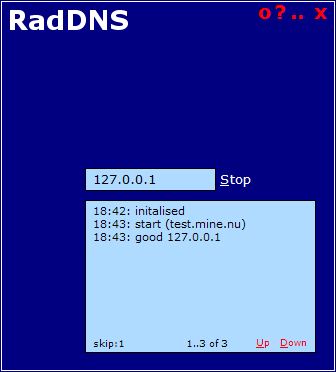 RadDNS is a basic DynDNS client, it updates a hostname with your current IP address. RadDNS was created due to existing DynDNS clients either didn't detect my IP correctly, crashed a lot or weren't free. As it is very simple I took the chance to mess around and have a non-standard GUI. I know now that it's best to stick to what every one knows for usability, but still, it was fun at the time. Especially the background image.